They say cobblers' children have the worst shoes. Dishing out daily examples of great charity communications is inspirational for the CharityComms team, but over the past six months we’ve become increasingly aware that our own visual identity and digital offering were falling woefully short of the example we were being set by others. 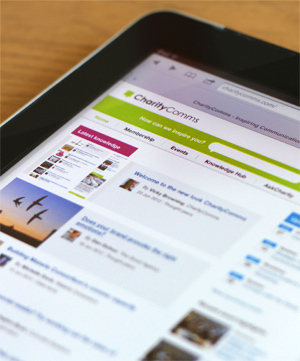 CharityComms’ brand values include concepts of inspiration, passion, and responsiveness. Put simply, we spend our days enabling charity communicators to share best practice, innovation and insight, and we try to be a friendly, helpful lot in the process. But our look and feel didn’t reflect this. It was staid, institutional, impersonal. Perhaps I say it as one who shouldn’t, but we have loads of fantastic content on our website. You were hard pressed to find it, though, without even a simple search function on the site. And we lacked the online interactivity we wanted with you, our audience. There was precious little opportunity for you to comment on what you were reading or contribute ideas of your own. So at the end of last year we decided to combine a redeveloped website with a brand refresh. We wanted a modern, interesting look, with bright colours combined with a sense of calm. We wanted to remain professional-looking, but didn’t want to make things complicated. And above all we wanted our brand to be engaging, with a real human touch to reflect our personal, supportive approach. And here’s the result. Ta da! We really hope you like it. Have a look round and you’ll see some new bits and pieces on the website (and do let us know if you spot any teething problems – chances are we'll have missed something). We finally have a search function that will let you find the inspiration you’re looking for, whether that’s in the form of thought pieces, top tips and guides, case studies or interviews. And you can now comment on all the articles and share them more easily via social media: we’d love to hear what you think. Our events calendar, showing all the seminars, workshops, conferences and networking opportunities we offer, is clear, simple and makes it very straightforward to book – we look forward to seeing you in person very soon! We’re here to help communicators develop their personal and professional skills, so we’ve introduced a My Career section. Here you’ll find career profiles of charity communicators doing great work, a whole host of generic job descriptions to help you in recruitment or assessment, plus a jobs feed from ThirdSector magazine. And it’s now easy for you to find out about the great benefits we offer to our members – from our unique mentoring scheme to the discounts on the great products and services offered by our corporate members. As always with this sort of project, it’s been a labour of love, with plenty of blood and sweat expended – although thankfully the tears have been few and far between. As a small charity ourselves, we didn’t have much in the way of resource, either financial or in terms of staff time, to deliver a combined brand refresh and new website. But our freelance team of designer Mark Bowley and developer Ben Knowles delivered over and above our expectations. And talking of expecting, just like the best Hollywood blockbusters, we have our very own Production Baby – Alexander Knowles joined us during the development process. So a big thanks to the development team, and to all of you who responded to surveys and questions about what you did and didn’t want from CharityComms. Welcome to our new website and refreshed brand. We’d love to hear what you think.